This 3 bedroom, 3 bathroom, Nevis island house is sited on a ridge, with lovely sea views, and is close to Oualie Beach. In fact, you’re about 3 minutes away from the Oualie beach resort where you will find all sorts of watersports. This location, and the generous proportions of the house, make it an ideal house to buy and let out to holidaymakers when you aren’t using it. The garden extends to just under half an acre (0.439 acres), so it’s easy to keep maintained, but large enough to make the home feel private and comfortable. The property is located on the hillside, within the Ridge Road community. Because you are high up, you have some stunning views over the sea to St Kitts. The sunsets are wonderful. There’s a heated swimming pool, measuring 25’ x 10’, which is just off the large covered porch. The porch covers 885 Sq Ft and is ideal for indoor/outdoor entertaining. The porch gives access to the very spacious living space, with enough room for plenty of sofas. There are two ceiling fans. The room is open plan with the kitchen which is bright and well equipped with modern appliances. The kitchen has an access door to the veranda. The property is built on 2 levels with most of the accommodation on the main upper level. This includes the living areas and two bedrooms. The master bedroom is enormous and has an adjacent walk in closet and an en-suite bathroom. This bedroom has access to the veranda using glass sliding doors. The guest bathroom is also on the main level, but on the opposite side of the house from the master bedroom. It also has glass sliding doors to the veranda, an en-suite bathroom A/C and a ceiling fan. On the lower level, there is the potential for a third bedroom. This area is currently used for storage, but with a little extra work, this would make an extra bedroom. The property is sold furnished. It is connected to Government water, but has two additional 1,600 gallon water tanks. The house is connected to mains electricity. 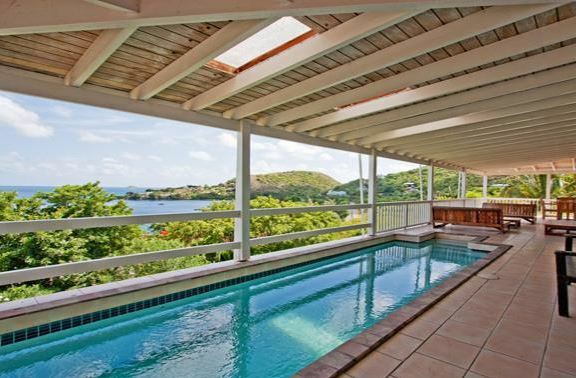 This entry was posted in Nevis Real Estate and tagged nevis houses, oualie beach. Bookmark the permalink.